Last night after dinner John said, “I have to go check the barn, the sheep sound different”. Bud had just gone out a few minutes before, barking madly at the yips and screams of coyotes in the valley. This always makes us nervous. A minute later he returned: it’s a lamb! Uh oh, my theory that Romney sheep are slow to mature and don’t get pregnant in the first year has been blown. And we have SIX of these adolescent ewes, all born last year in February and March. We could end up with a lot more lambs…. 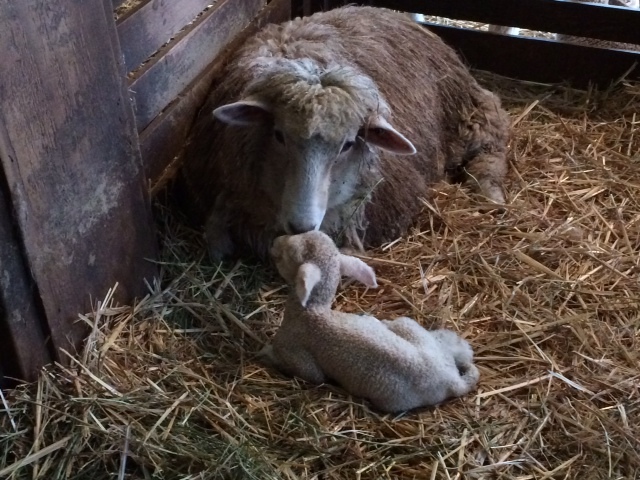 So a little ewe lamb, 71/2 pounds soaking wet, was born to ewe number 1313 [the thirteenth lamb born in 2013]. The birth happened right outside the lambing pen, which was good, but in a very muddy spot, which was not so good. Mama was attentive to all the cleaning required, which is extensive when your only rag is your tongue. However she was not going to tolerate the lamb going under her to find the teat. Perhaps it was because the afterbirth had not been delivered, perhaps the mother’s udder was tender as it filled. 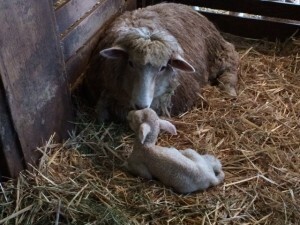 With experienced mothers, it is best to just leave them to it and trust that the lamb’s instinct will win out. But not so much with first-time moms. We had not trimmed away the belly wool from our yearlings since we didn’t think they were pregnant. So John rolled mom over and I got the shears and cut away lots of wool, and we plugged the lamb in. She eagerly took the colostrum. Went back an hour later and restrained mom so baby could eat some more. At this point it was 11:15 and we went to bed. This morning, mother and baby seem fine. The baby’s little stomach looks full and John saw her feeding, though mother is still a bit skittish. Now the daily lamb watch resumes. Reading this makes me feel tired. How do you two manage to get through lambing season in decent shape with some decent sleep? Maybe you don’t but I’m lucky enough to live far enough away not to see you in your lack-of-sleep state!